K.B. Etoile de Lumiere (known as Henry) is both home bred and produced. 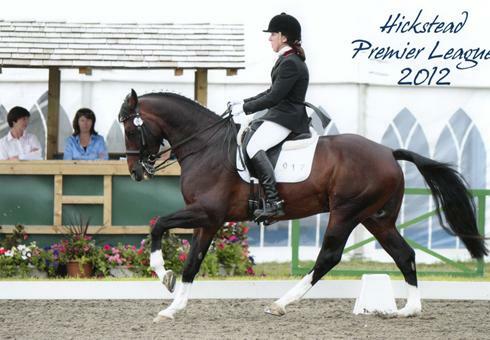 Henry was awarded a 1st Premium twice at the British Breeding Futurity Evaluations receiving scores of 8 and above for type, gait and athletic ability. He was then graded by the SPSS in October 2007 as a 3 year old. 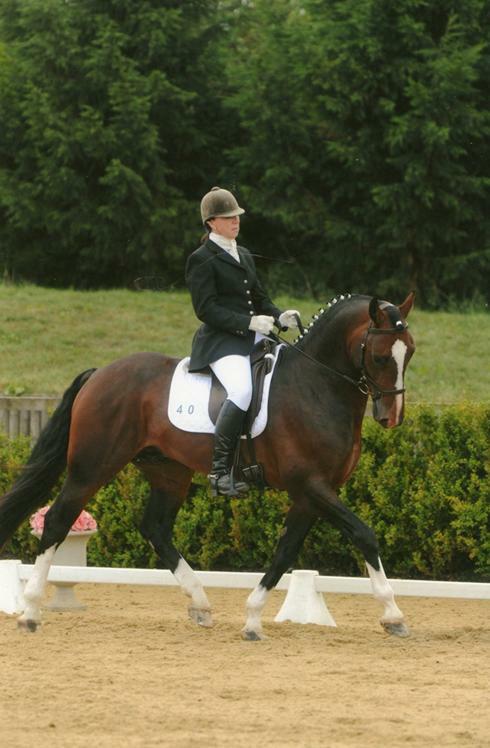 He started competing at Affiliated Dressage in 2009 and in just 2 years qualified for the Novice and Elementary Regional Finals and was placed at the 2010 Hickstead Masters Elementary Final and regularly scored over 70% at Elementary. In 2011, he had many wins at Medium level and qualified for the Medium Regional Finals. 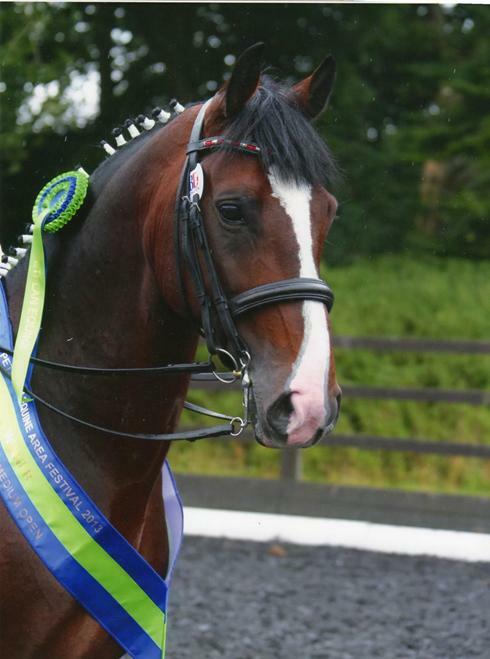 He was second in the semi-finals at the Masters Medium Championships at Kingston Maurward and the placed 12th out of the top 32 horses in the country in the Masters Medium Finals at Hickstead International. 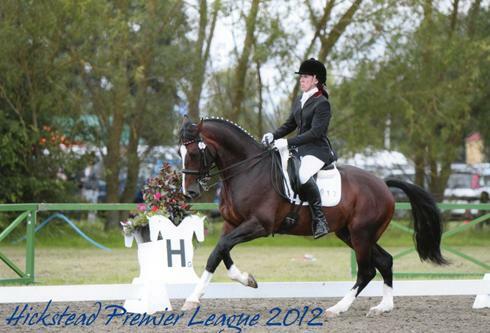 Henry has qualified for the 2013 Winter Medium Regional finals and the 2013 Pet plan Advanced Medium Finals. He continues to work at Advanced level at home. 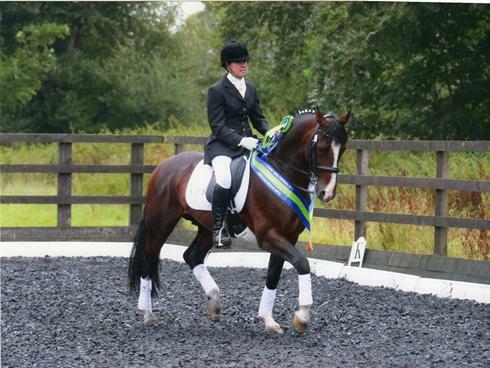 K.B.Etoile de Lumiere won the 2013 Pet Plan Advanced Medium Open Regionals at Moreton EC. He won with a score of 69.56%. His dam K.B. 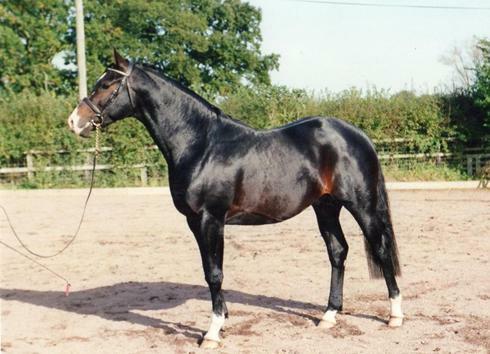 Etoile Filante was home produced by the home bred Stallion K.B.Arc-en ciel. K.B. Etoile Filante was competed to Elementary Championship level before having her competition career cut short by fracturing a fetlock in the field. 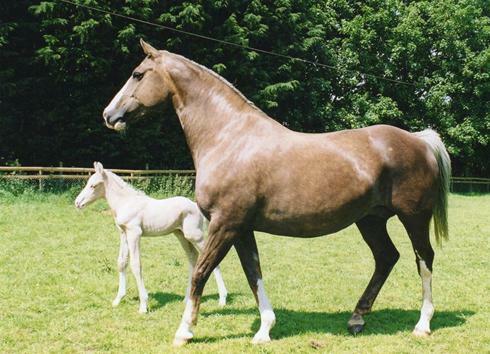 She was subsequently graded with the Sport Horse Breeding Society of GB. K.B.Etoile Filante has bred the following. K.B. 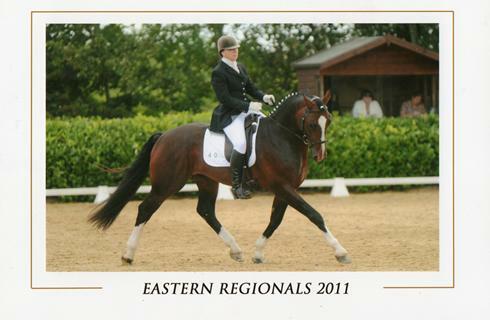 Etoile D’Or ( awarded a High First Premium at the BEF Futurity Championships 2011) as a 3 year old. K.B. Etoile Filante has been awarded numerous Broodmare Diploma’s for her breeding success. Elite Graded Sambertino placed 8th out of 43 stallions on his 100 Day Test with two rarely awarded maximum 10’s for Temperament and Attitude to Work. 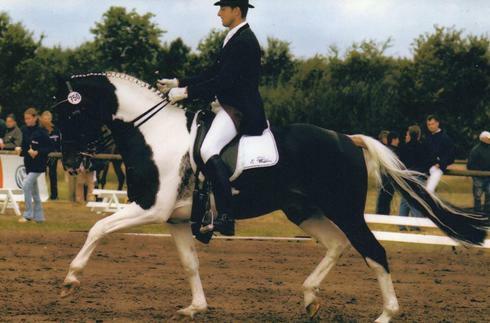 He competed with Amateur and Professional riders through Europe with great success and despite being the only coloured dressage horse in the German Hanoverian region he won or placed every time out culminating in him being crowned Landkreis Dressage Champion. K.B.Arc-en-ciel was homebred and produced. 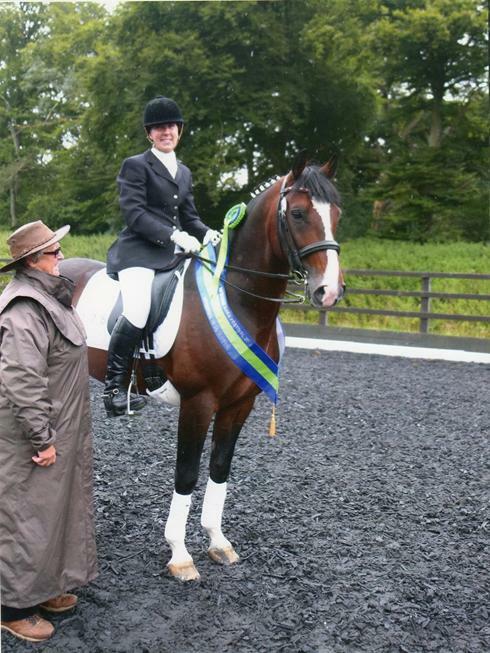 He competed to Prix St Gearge having qualified at all levels from Novice to Advanced Championship. K.B. 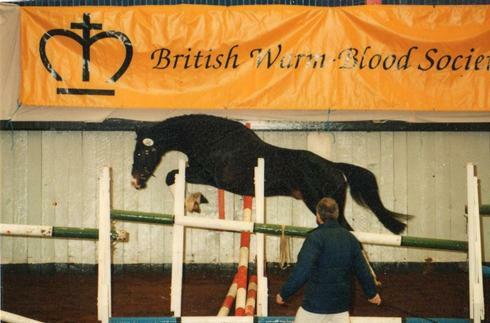 Arc-en-ciel was by the legendry Stallion Atlantus, one of the foundation stallions for the breeding of warmbloods in the UK. K.B.Arc-en-ciel was acknowledged as one of Atlantus most notable progeny and was ranked 6th and 8th out of the top ten stallions in the country for competing Dressage Sires foaled during or after 1989.